Do you ever have times where you feel the need to disconnect? To step away from the computer, from social media, altogether for a few days and just reconnect with the world around you? To reconnect with your family, your spouse, your children? For us, it’s been the past four or five days. All the kids are home and it’s summer and sometimes we find we just need to be ‘present’. It’s amazing all that we always manage to get done during our completely unhooked periods. We deep cleaned. I’m talking the whole house, furniture pulled away from walls and cleaned behind. Carpets washed. Walls painted. Clothes and toys purged. We had movie days and movie nights. We rode bikes and threw footballs. We spent time with family. We talked. It was a much-needed and refreshing change of pace. But, starting tomorrow we’ll be back on the blog, emails will be re-opened, and social media re-visited. Thanks guys for understanding the need to occasionally go off-line. I promise the rest of this week holds several goodies in store! 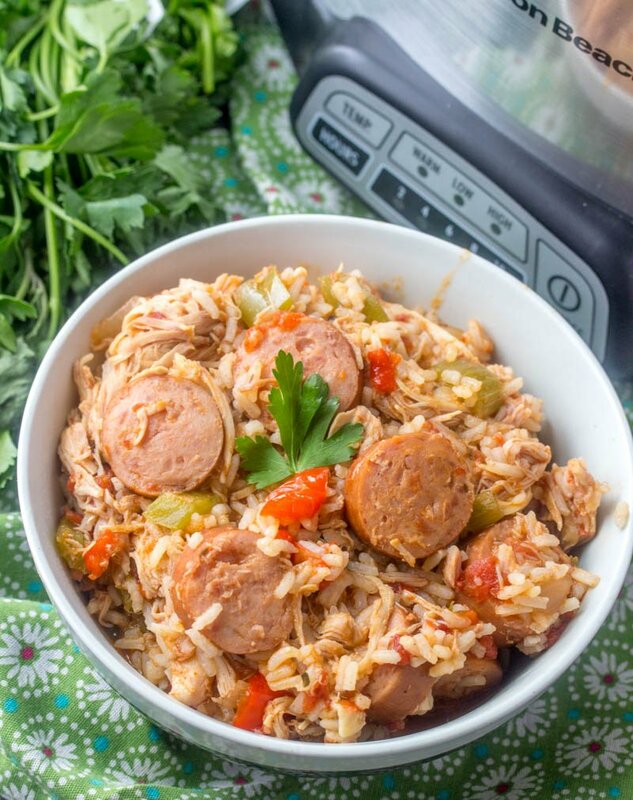 For me, the crock pot is a summer must-have for come dinnertime, because turning the oven on is so not happening. When we think crock pot cooking, I know I typically think warm winter stews and casseroles, but it’s actually the steamy miserably muggy months when the crock pot becomes my BFF. My let’s make beautiful kitchen magic together, and save me money at the same, time forever friend. 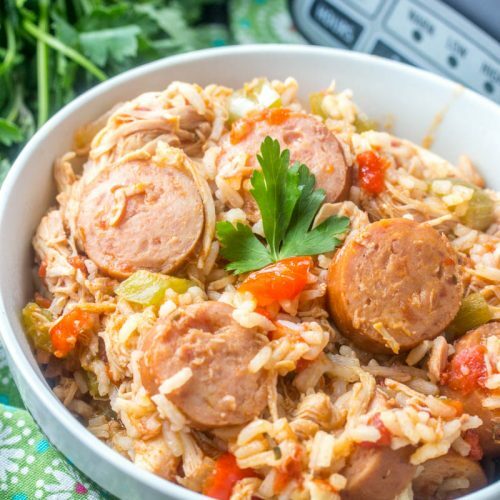 Crockpot Chicken, Sausage, & Rice is another one of my favorite crock pot meals to make, whatever the season. 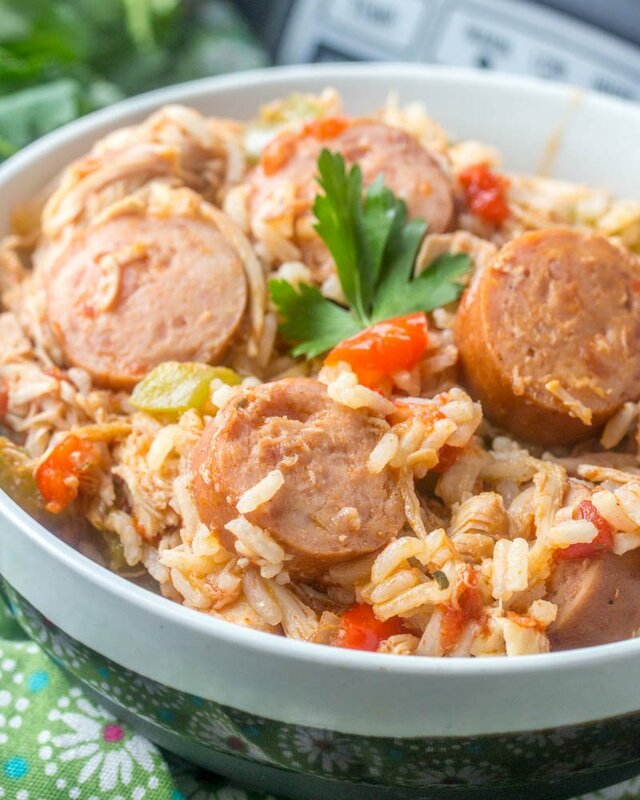 The chicken comes out cooked to tender perfection and pairs perfectly with the sausage. So much flavor! Round out the meal by serving this with a nice, warm piece of crusty bread and a refreshing side salad. 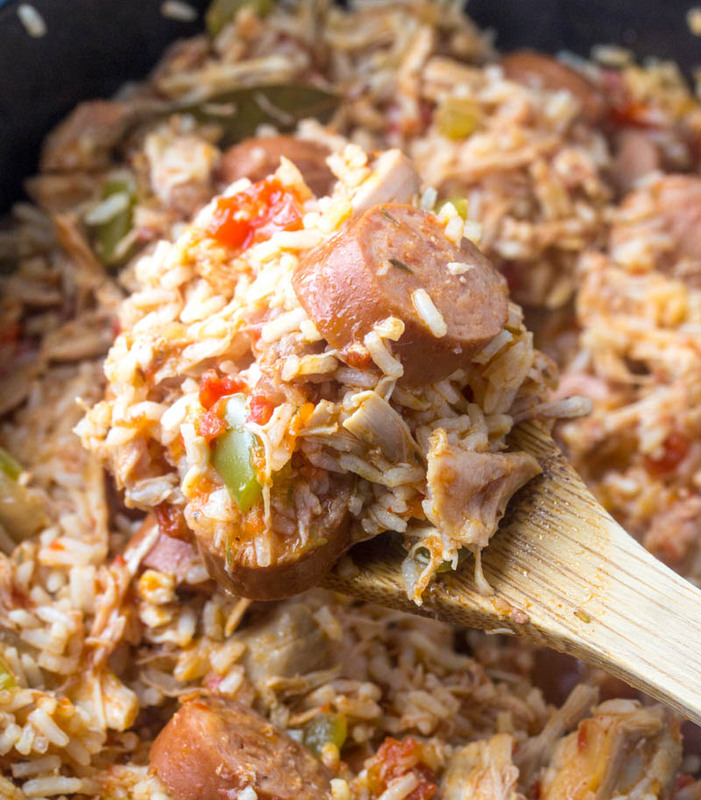 An easy Cajun style dinner, this 'casserole' cooks itself in the crock pot and features both chicken and smoked sausage. Place sausage, bell peppers, onions, celery, tomatoes, broth, bay leaves, thyme, paprika, and garlic powder in slow cooker. 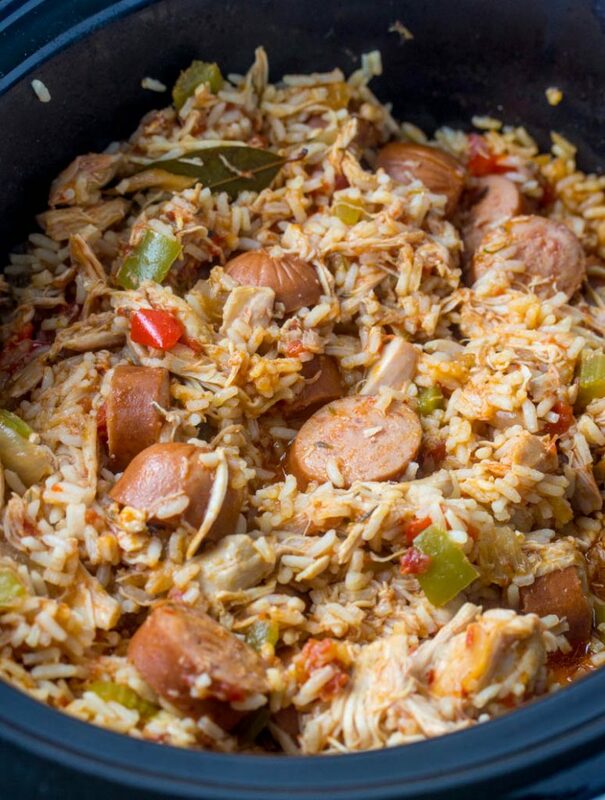 Top with chicken and sprinkle with black pepper, and crushed red pepper flakes. Cover and cook 8 hours on low or 4 hours on high until chicken is cooked through and vegetables are tender. Cover and cook 15 to 20 minutes until rice is tender. Remove bay leaves and chicken bones before serving. For best results, do not remove lid during cooking. 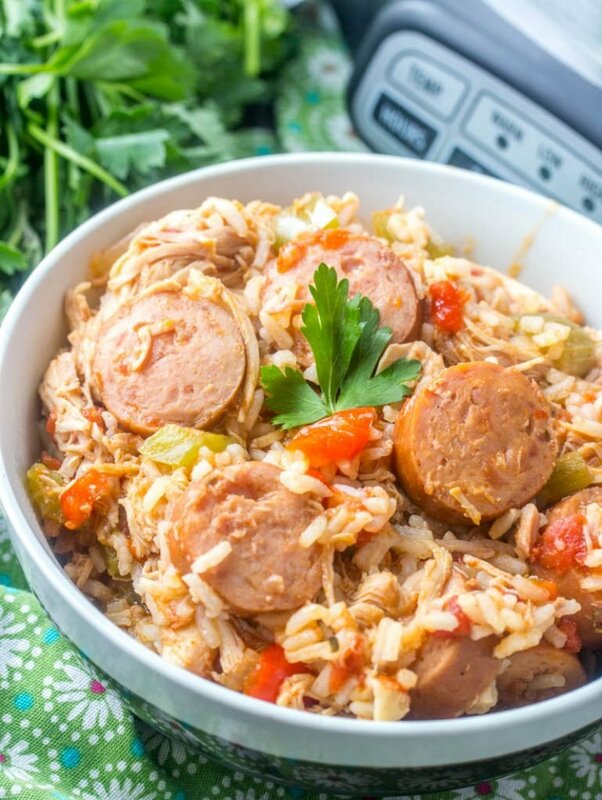 What a great Crockpot meal, I just love this combination of flavors! Thanks so much for sharing with Full Plate Thursday and have a great weekend! It’s winter in Australia and this also sounds like the perfect winter dinner. And so simple too. Thank you for sharing this recipe with Fiesta Friday! I can relate to what you said about disconnecting from the internet for a while. It can be really refreshing, and it’s amazing how much difference it makes to family/friends quality time. Glad to hear you are back and recharged for more blogging fun! oooh sound yummy, i love crockpot meals! Looks delicious! Thank you for bringing it to the party, over at Fiesta Friday! My Mom used to make something kind of like this but only with sausage! I bet the flavors all combined are wonderful. Thanks for sharing with us at Fiesta Friday!